Eggs are easy to blend, cook and scramble with other foods, and are high in fat-soluble vitamins, choline, folate, selenium, lecithin, iodine, and omega-3 fatty acids. Seaweed, nori, kelp, dulse, algae, spirulina, chlorella and other ocean flora is incredibly high in iodine, magnesium, manganese, iron, and trace minerals. Liver is a fantastic source of fat soluble vitamins and is extremely nutrient dense. fry it up with butyric-acid rich butter and quercetin-packed red onions for optimal taste and nourishment. Chicken, beef, pork or other bones work just fine. Bone broth is an excellent replacement source of vitamins, minerals, amino acids, and fatty acids. Oysters and mussels are extremely nutrient dense, and just a few medium-sized oysters can supply over 1000% of your daily vitamin B12 needs, along with a huge dose of vitamin A, Vitamin E, copper, selenium, zinc and essential fatty acids. 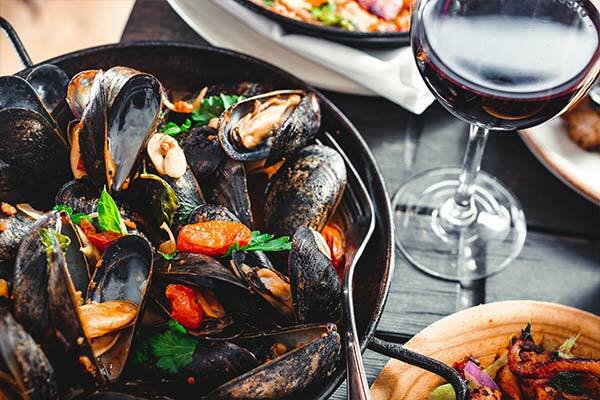 Mussels are a close second, and are rich in the entire B-vitamin complex, along with selenium, zinc, protein, magnesium, and manganese. This is perhaps the horse that has been kicked most to death in nutritional advice, but it really is true that you need to eat colorful foods and lots of them. The polyphenols and bioactive compounds found in plants are no higher than in fruits such as blueberries, raspberries, blackberries, purple grapes, pomegranates and currants, vegetables such as purple cabbage, kale, organic tomatoes and dark orange carrots, and starches such as sweet potatoes, yams and taro. 7. Fermented foods Fermentation of a food increases that food’s nutrient bioavailability and digestibility, and renders many digestive irritating foods (such as dairy or soy) extremely digestible and nutrient dense. Natto, kimchi , kefir, pickles, yogurts, sauerkraut kombucha and dark chocolate are all options. Your crucial energy requirements require precision nutrition. Artichokes, arugula, asparagus, broccoli, brussels sprouts, kale, lettuce, parsley, mushrooms and spinach, you should try to eat these foods as fresh as possible – and avoid storing them in the refrigerator or vegetable crisper for long periods of time. Carnitine Xone capsule daily to support fatty acid oxidation, mitochondrial metabolism and glucose tolerance. This supplement has been shown to improve exercise tolerance and reduce lactate production. Fit Food Whey for added amino acids, energy production with immune support.